The multibillion pound redevelopment of London’s iconic Battersea Power Station has the eyes of the world on it. You might have seen this in the news, but what you might not know is that we were part of the team who took on the huge task of decommissioning and reconstructing the structure’s well know and well-loved chimneys. Here’s a look at what we did, and how we did it. The Grade II* Table Top chimneys of Battersea Power Station have stood as a London landmark since 1933, but they were no longer structurally suitable. As part of the prominent building’s redevelopment they needed to be taken down, for safety, and rebuilt, for national heritage. Castle & Pryor were asked to collaborate in the removal phase of the chimneys, which were being de-commissioned and reconstructed one at a time to mitigate the impact on the capital’s iconic skyline. 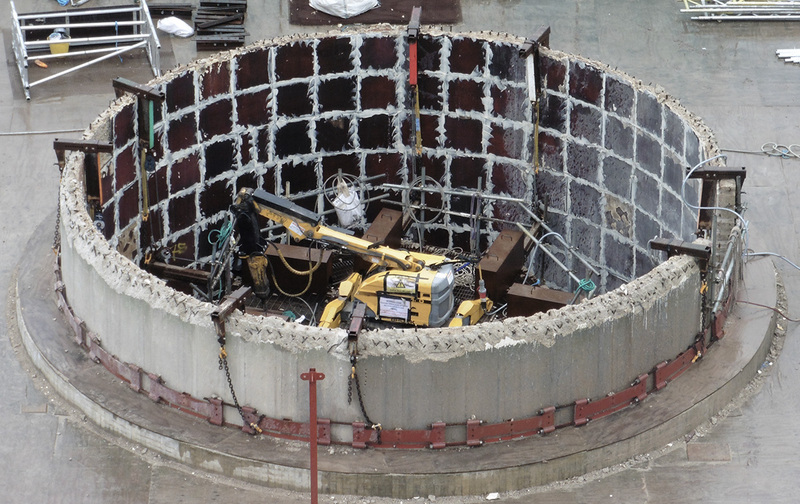 The outer concrete structures were riddled with microscopic fisher cracks, making them unpredictable under demolition - this meant that the selection of a demolition method was more important than ever. Before calling us in, our client had tried using a hand held hydraulic crushing method to complete the work but this proved to be very slow and not commercially viable - an alternative plan had to be hatched if they were to get the job done on time and on budget. The first decision was to form an opening at the base of the chimney, to give the Brokk access to the inner shaft. We did this by diamond cutting the concrete with a remotely operated track saw, and removing the cut sections non-percussively. This gave the structural engineers a chance to assess the structure and equip themselves with some insight in to how the concrete would behave under demolition. 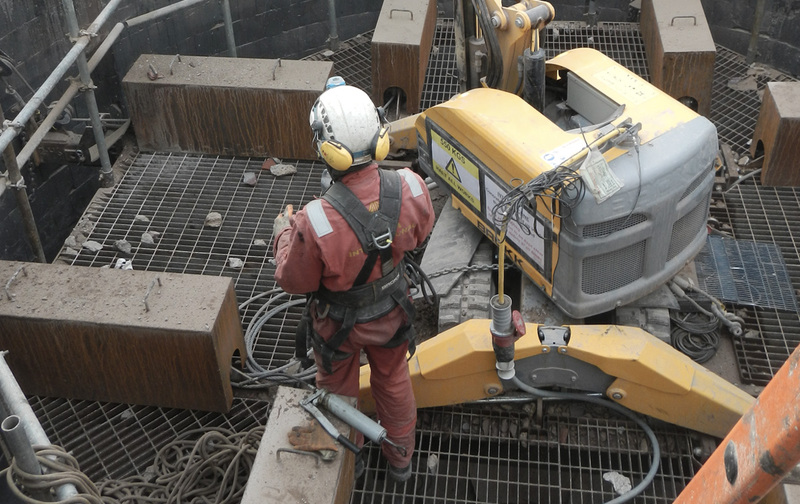 We knew our Brokk 160 demolition robot was the right machine for the job, but this presented us with a new problem – getting a large, 1600kg piece of machinery up to the top of the chimney structures. But difficult doesn’t stop our team, collaborating with other constructions teams working on the Battersea project they devised a solution. They loaded our robotic machine on board a bespoke hydraulic lift platform, able to take up to 2000kg of weight, built inside the chimney cavity by the Delta team which was then raised right to the top to begin work. 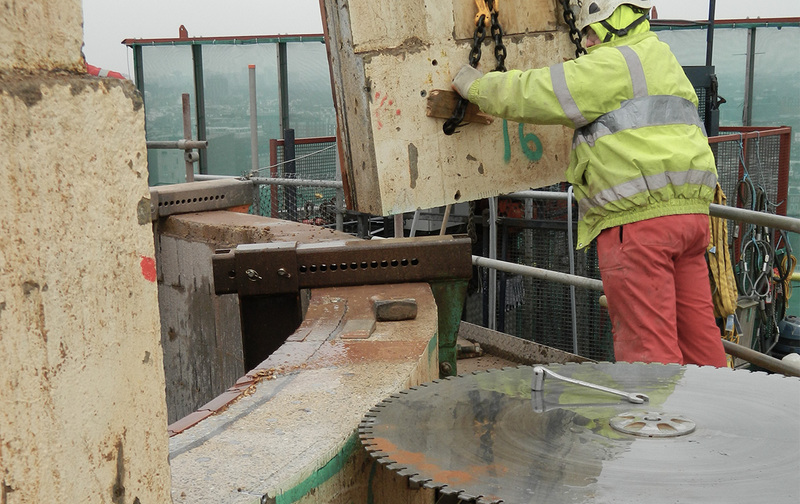 The Brokk 160 proved to be a huge success as it’s remotely controlled arm could access all of the concrete outer ring from the constructed platform, allowing the team to remove incrementally and maintain a controlled demolition. 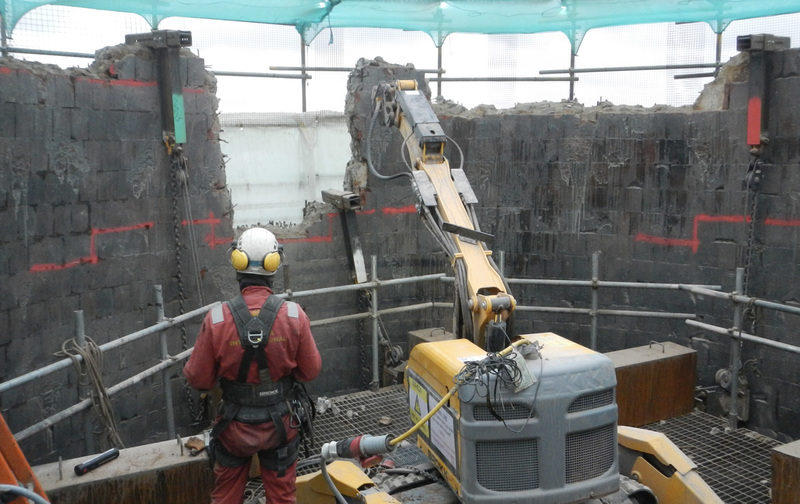 It was also a great solution for safety, as the Brokk could be remotely operated from outside the demolition zone on an access external scaffold - keeping the whole team out of dangers way. Thanks to our team’s clever thinking and collaborative spirit, we successfully completed the demolition of these towers on time, without incident and with a very happy client. This project was a real joy for us - bringing together the skills of steeplejacks, demolition experts and specialist machinery. It allowed our team to do what they do best, solve problems and deliver just what our clients needed. Do you have a project you’d like our expert team to take a look at? We’d love to talk about it, do get in touch.